Ever wonder how Shenmue protagonist Ryo Hazuki kills time in between forklift races and ponderously searching for his father's killer? As you probably guessed, he races go-karts against Sonic the Hedgehog. At least, thats the concept behind Sonic & Sega All-Stars Racing. Like Mario's eponymous kart-centric gaming line, S&SA-SR takes a few handfuls of Sega's most iconic characters, completely ignores my cries for just one representative from the original Phantasy Star series, inexplicably includes a Prehistoric character who few remember and even fewer like, and jams the whole thing into the cockpit of a cartoonish go-kart. Ryo, protagonist of the Shenmue series and one of the most requested SEGA character to make an appearance in All-Stars Racing will be riding his borrowed motorcycle around classic SEGA themed race tracks. And when a motorcycle just can't cut it, Ryo unleashes his All-Star move and is able to swap vehicles to his iconic forklift to charge and barge opponents out of the way! 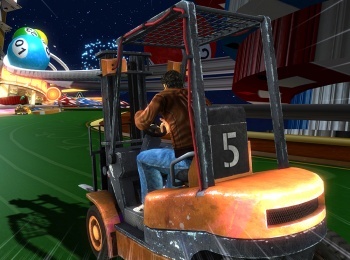 Okay, I will tentatively offer Sega a high-five for referencing the forklift, but until the company gives me a Nei or Alys cameo I'm going to continue to stare at the entire corporation through the jilted eyes of a former lover (a former lover who shelled out the dough for the Sega Channel for nearly 4 years). If you've grown past your scorn, Sonic & Sega All-Stars Racing hits store shelves on February 10, 2010.